(4:35 p.m. EST) – The upcoming luxury expedition ship from Crystal Cruises, Crystal Endeavor, will have many of the line's favorite dining venues, as well as spaces designed for maximum views and high-tech vehicles for exploring off the ship. Coming in 2020, the 200-passenger ship will "be an industry game changer," Crystal CEO Tom Wolber said at a press conference. "It delivers on what Crystal does best." 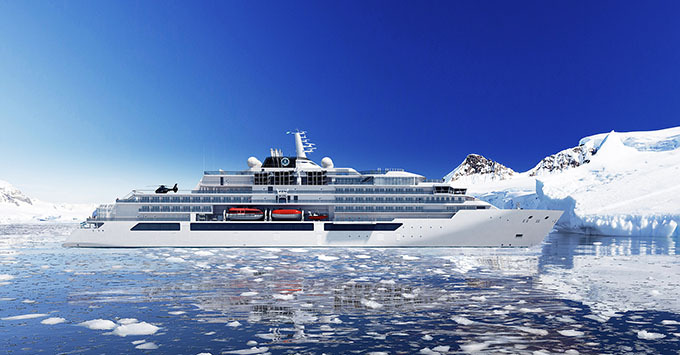 Crystal Endeavor will have 100 suites and be polar class 6 compliant, meaning it can sail in icy, polar waters in the summer and autumn. There will be six restaurants onboard, including Prego, a traditional Italian venue that will also host the line's signature "Vintage Room" winemaker dinners; Umi Uma, the sushi restaurant from famed chef Nobu Matsuhisa; and Waterside, the main dining room. The ship will also have the Bistro Cafe, which will offer full-service breakfast, lunch, espresso and teas. Silk Kitchen & Bar, a Chinese comfort food restaurant that was added to Symphony during its refurb, will take over the ship's solarium on certain nights, Wolber said. That solarium will be two stories, with a glassed-in pool and plenty of views. Also with floor-to-ceiling views, the Palm Court will be used for afternoon tea, cocktails and dancing. Other lounges include the Connoisseur Club cigar lounge; Crystal Cove, where passengers can gather for guest speakers, pre-dinner cocktails and entertainment; and a casino -- the only one on an expedition yacht. Enrichment venues on the ship include the Captain's Lounge, the Expedition Lounge, the Helicopter Lounge and The Library. A Promenade will stretch along part of the ship, and have areas for passengers to have cocktails and views. There will also be a boutique. Other onboard amenities include a fitness center and a spa and salon, with three treatment rooms, separate men's and women's steam and sauna rooms and a relaxation room. The ship will also have an expansive mud room, where passengers can change into expedition gear before going out on Zodiac tours. Finally, Crystal Endeavor will have two eight-person helicopters for excursions, as well as a submarine. Where they will be deployed will be subject to itineraries and permitting, Wolber said. At the press conference, Wolber also released some new details about Crystal's next class of ocean cruise ship, called Diamond Class. These ships will be smaller than the line's current vessels, with 800 passengers, and they will no longer have residences for sale, Wolber said. "That size is the right size for the level of service and personal detail that is core to the Crystal brand," he said. Right now, the line is going to start with one Diamond Class vessel and see how it's received in the market before ordering more, he said.